Making my home more "green" is something I am passionate about, and Reuseit.com is a great website to help you make that transition! From the kitchen to the office and more, Reuseit.com has a great green product for you. I had the opportunity to review their Aladdin 16 oz. Leak Proof Recycled and Recyclable To-Go Mug. These travel mugs retail for $7.95 each and their website offers a flat shipping of $4.95 everyday. The Aladdin 16 oz. Leak Proof To-Go Mug comes in 3 different eye catching colors: Pepper, Lake, and Lilly. I received this mug in the Lake color and it quickly became my favorite mug in the whole house! I love it's beautiful blue hue and I also love the cool touch built in sleeve that keeps me from burning my fingers when I drink my coffee. These mugs get even better with the fact that they are BPA free, made from 97% recycled materials, and they are also dishwasher and microwave safe to boot! One thing I look for in a travel mug is if it's leak proof because I've worn one too many coffees in my day. 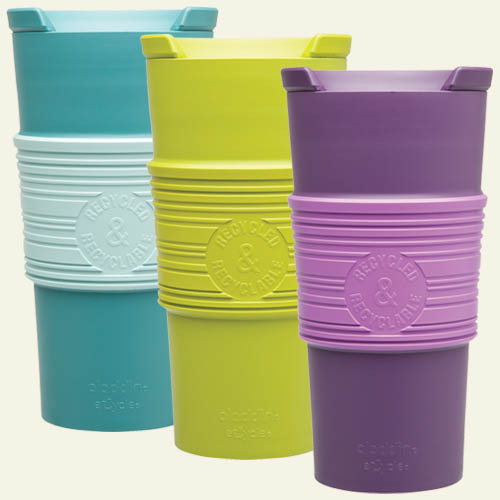 This mug is truly leak proof and has an easy adjustable lid for drinking. I am very pleased with this product! Check Out These Wonderful Coffee Gifts From Reuseit.com!